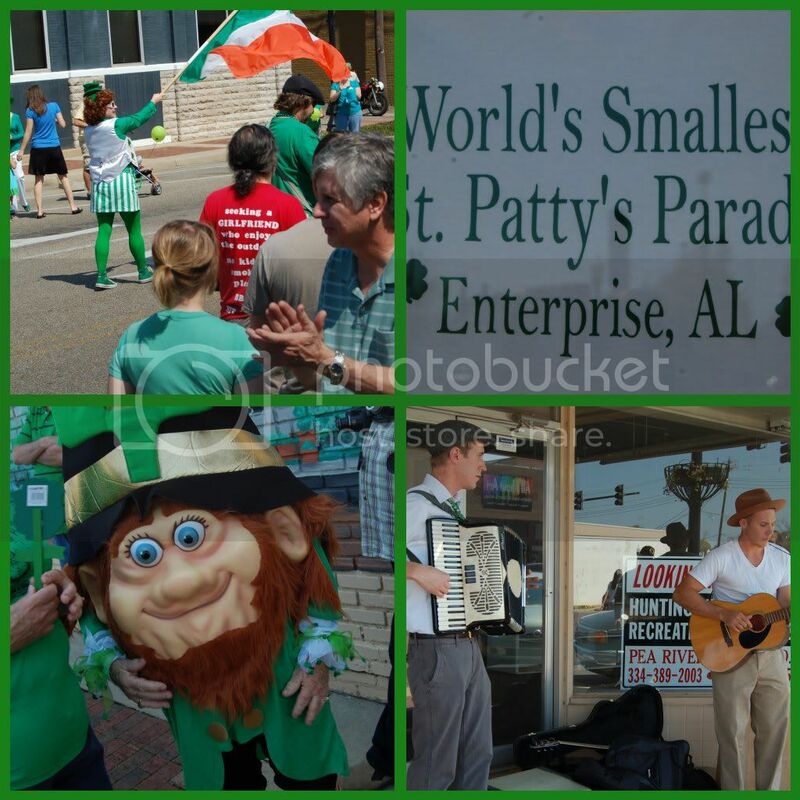 Yesterday, we went out to see what was happening in our small Alabama town for St. Pats. So, you may not know but we have lived in Savannah for the past 5 St. Pats. Savannah is home of the 2nd largest St. Pats party in the country. So, of course, because life is ironic like that, we live in the town with the SMALLEST St. Pats parade. In case you're wondering what the smallest parade is like, it's one woman. One woman walking down the street holding a flag. And while you think that might be disappointing, it was actually quite hilarious. The street was lined with green. There were musicians and families and costumes. Once again, Alabama. You crack me up! After the "parade" we enjoyed the sunshine some more and helped Jonathan practice riding his bike on two wheels. Jeremy was on "fall patrol" and my Mom & I were cheerleaders. He did pretty good. I have to learn not to coddle him every time he falls, but sometimes it's SO hard. Well this isn't much of an outfit post since I never got a good full shot of my outfit. It was a gorgeous day out. Time to bust out the capri's. So what do you think of the new design? I needed a change. I'm sorry if it's too big. I need to work on that. I'm working on a monster iMac screen so it fits mine perfectly. Then I look at it on my hub's laptop and it's gigantic. I have those same capris. They are soo comfy! Love the new design. It's looking great! PS I love your green TOMS! I never have enough money to buy more than just the regular black pair I wear everywhere, but I've always wanted to have 2 or 3 colors to choose from. They're so expensive here! I have no idea how much they cost in the States, but here I pay close to 80$ a pair. Ugh. WHAT! $80? I don't even care if this is illegal, but I think I'm gonna have to start smuggling you Toms at a decent price! I got my first pair for $45 and the green pair I won in a giveaway. Can you buy them off the site for a regular price? Love all the green, yall look so festive!!! Jude is so precious in the Ergo!! Thanks :) He's starting to really hate it. He just wants to GO.